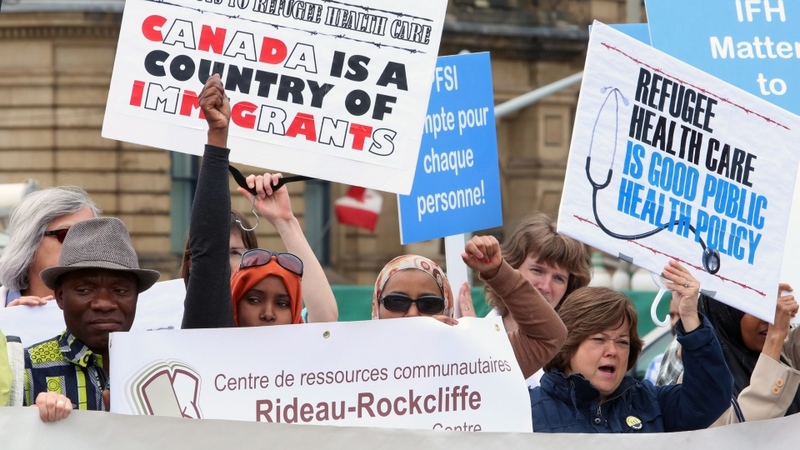 The Harper government is being slammed, once again, for their treatment of Canada's refugees. The Toronto Star is reporting that Ottawa is actively lobbying provincial authorities to cut refugees off welfare "as soon as the Canada Border Services Agency (CBSA) issued an 'enforceable removal order' against them." According to the provincial Ministry of Community and Social Services, there were 1,390 social assistance recipients terminated in Ontario between April 2004 and March 2013 with “unsuccessful refugee claimant” as the primary reason. By comparison, 502 recipients were cut off for the same reason in the first eight months of this year. On the surface, it makes sense. If you're not legally allowed to be in Canada, you shouldn't be entitled to taxpayer funded benefits — right? But critics argue that some of these refugee claimants — who are refused benefits — are still in Canada in the middle of appeal or other administrative procedures (ie: humanitarian applications or requesting of travel documents) and deserve due process. In other words, they say, social assistance should only be cut when all appeal processes are exhausted and the refugee is physically removed from the country. "The problem is that often the story for failed refugees does not end at the point of refusal. There are appeals and other applications under the law that are available to them. Some times these applications and appeals are successful in the end," Toronto-based immigration attorney Michael Niren told Yahoo Canada News. "So imagine a case where a refugee claimant was initially refused but then won on appeal. Does that mean that during the appeal process, the refugee should not be entitled to benefits? That seems very inconsistent because such claimants get social assistant pending their claims in the first place." Over the past couple of years, the Harper government has been criticized for their hard-line on 'un-invited' refugees. They've placed restrictions on claimants from countries unlikely to produce legitimate refugees and, last year, restricted claimants' health benefits leaving some refugees with only 'urgent health care' and others with care only if they have a disease that would be a risk to the public. The government justified the changes citing reports that some applicants — primarily from Hungary and Mexico — come to Canada solely for the purpose of "exploiting" social assistance and health benefits. Then-Immigration minister Jason Kenney offered up some statistics saying that between Jan. 17 and Dec. 31, 2011, 8,819 Mexicans racked up nearly $7 million in health care costs under the Interim Federal Health Program. To add insult to injury, 5,068 refugee applications from Mexico were either rejected, withdrawn or abandoned in 2011. But Niren, suggests that a lot of the government's decisions on refugee policy has been based on populist politics rather than on a sense of fairness and due process. "Once again the government is seeing this strictly as an enforcement issue which is politically appealing to voters," he said. And you have to imagine that policies like this are appealing to the vast majority of Canadians. According to the Star, social assistance to all refugee claimants in Ontario cost taxpayers about $232 million. Nationally, in 2011, there were 16,122 rejected claims. Paying welfare benefits to those 16,122 people, who are deemed to be "unsuccessful refugee claimants", is not going to be palatable for most taxpayers. For some it will be a case of 'due process be damned'.